ashlee nicole spills | blog: Remembering Tupac. Today has been an eventful day. During the VMAs, Janet performed for the best MJ tribute, Kanye went in hard on Taylor Swift, Lady Gaga gave a killer performance -- literally. Yeah, the VMAs were awesome, but lest we forget what September 13th is about and will be about for years to come, the anniversary of Tupac's death. It doesnt seem like many have dedicated posts to the late rapper, but I will. 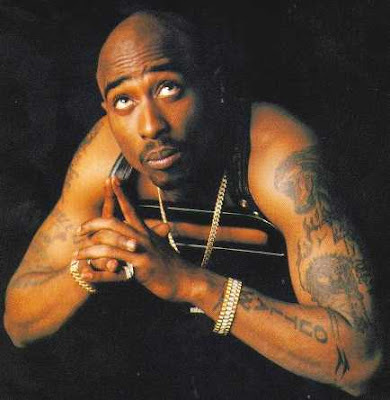 Ive always been and will always be a fan of Tupac, so I'll take this time out to reflect on the his career as one of the best hip-hop rappers of MY time. I remember when I first heard the news. My family and I were about to go and eat dinner at a restaurant in the Hilton. We were in the parking lot, and I switched the radio dial to Q93. All I heard was Wild Wayne say to a caller, "Yeah, man, it's true. Tupac is dead." That was at about 6:30p. The tears started rolling. That was a bad day.